An Angus town is celebrating its place in rock history, with events dedicated to one of its most famous sons. 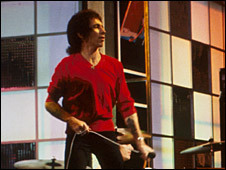 The third annual Bon Scott Weekend is being held in Kirriemuir. A number of young bands will be playing along with an AC/DC tribute and rock covers band. Scott was born in the town in 1946 but moved to Australia when he was six and later became the singer with AC/DC. He died of alcohol poisoning in 1980, aged 33, after a night of heavy drinking in London. Two years ago, a plaque was unveiled in Kirriemuir dedicated to the frontman. Victoria Melton, one of the organisers of the event, said: "Bon Scott is one of Kirriemuir's sons, and what better a man to pay tribute to. "He's been a huge influence to a lot of people all over the world. "We feel that he always remembered his roots and he had a strong character." Her colleague Steven Gibbons added: "He's the singer that the band had that everyone talked about. He's obviously quite an important icon in rock music. "Everyone who plays any rock influenced music, they can't really ignore the influence that AC/DC have had, especially the Bon Scott era music, which was really powerful, and it's still as powerful today as it was back then."